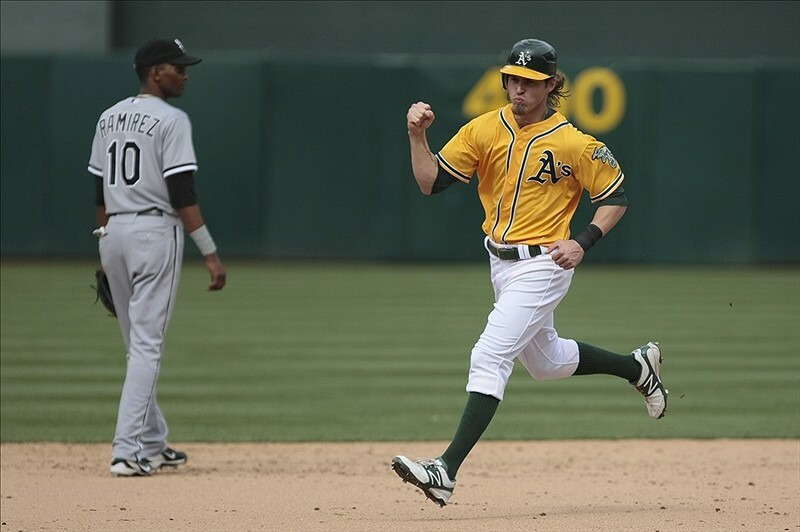 Josh Reddick and the Oakland A’s are, to the surprise of many, one-game over .500 and sit second in the AL West. Can they keep it going with a collective batting average of .218? LIVINGSTONE: A’s three-hole hitter Josh Reddick is having a bit of a breakout year, his first with the club out of Oakland. Having spent three years between Triple-A Pawtucket and the Boston Red Sox, filling in post trade in 2009 (Sox shipped Adam LaRoche out of town) and injuries in 2010 and 2011, Reddick is getting his first full season under his belt after being dealt to the west coast team in the off-season (Sox got now injured closer Andrew Bailey and hot-hitting, defensive specialist Ryan Sweeney). In 149 at-bats this season, Reddick has surpassed his HR total from last season where he hit seven in 278 at-bats. Compared to the eight he’s hit this year in 34 games, Reddick looks to have broken out the power-bat many thought he had tucked away in his arsenal of above-average baseball abilities. Tack on eight doubles, 19 RBI and four stolen bases, Reddick is part of a strong 3-4 duo in the middle of a offensively weak batting line-up (Yeonis Cespedes is the other half of the duo – on the DL at the moment). Well, maybe a trio is forming with the explosive hitting of recently signed Brandon Inge. Inge, who the Detroit Tigers let go earlier in May, has been on a tear as of late (6-for-21, 3 HR, 12 RBI, .286 BA), and could beef up the line-up for the remainder of the season. While Reddick is one of the minor success stories for the A’s early this season – the fact the team is second in the AL West with an 18-17 record is almost as shocking as the Baltimore Orioles leading the East (ok – not nearly as shocking, but still…). After an off-season fire sale by GM Billy Beane in which the Moneyball man shipped pitchers Trevor Cahill, Gio Gonzalez and Andrew Bailey out of town, many wondered how the A’s would compete with teams like Texas and Anaheim (or LA or whatever you call them now). But the fact remains, they’ve stayed competitive, even with potential ace Dallas Braden on the DL and the team hitting a collective .218 for worst in the league. The A’s rank 28 in OBP (.293), Slugging (.348) and OPS (.641). While the hitting is under-performing to say the least, the pitching has been a positive sign considering the losses the rotation endured in the off-season. Veteran Bartolo Colon is 3-3 and pitching efficiently and effectively, eating up innings in the process. Tommy Milone is 5-2, a big surprise for the starting rotation that lacks depth – well, in fact, there isn’t any depth at all really. Future ace Brandon McCarthy is 3-3 woith a 2.56 ERA and has been playing great ball all season long. In the bullpen, only Grant Balfour posts an ERA higher than 3.86 (he posts a 4.24) and at least three guys – Ryan Cook, Jerry Blevins and Jim Miller – all post ERAs under 2.00 while pitching in at least 10 innings (0.00, 1.69 and 1.93, respectively. Note: Cook has thrown 16.1 innings and has yet to let in a run). Jemile Weeks, Cliff Pennington, Kurt Suzuki? The Answer: three guys that are under-performing. If these three guys can start hitting the ball well – and Coco Crisp can remain healthy – plus, we all remember the A’s signed Manny Ramirez in the off-season. If Manny comes back and hits the ball well, like we know he can, he will provided a much needed offensive injection into the order and make for a strong 3-4-5-6 of the order. No matter what, the fact the A’s are one-game over .500 and sit second in the West is exciting – but can it last?